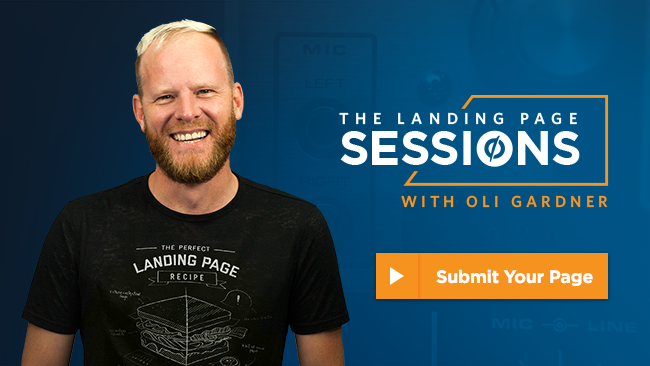 Oli Gardner Wants to Improve Your Campaign Landing Page. For Free. Ever have a brilliant marketing campaign that just isn’t living up to expectations? It’s easy to tell that something isn’t quite right — your poor conversion rate screams it loud and clear. But pinpointing the squeaky wheel is no simple feat. Is your landing page the problem? Your emails? Ads? Remarketing? Do people just think you’re a jerk? Quit wondering — we’re here to help with our latest web series: The Landing Page Sessions. Oli Gardner, our resident landing page expert, will focus on one page per episode and help show where you might be leaking conversions. He’ll even rebuild the page with his suggested changes, and show you how a few tweaks can make all the difference. Sound like something that could be valuable to you? Just send us your landing page along with the ads and emails that sent people there so that Oli can evaluate your page in the context of the larger marketing campaign. If your submission is chosen, Oli will dedicate an entire episode to reconstructing your campaign. Yo, there is no catch. What are you waiting for?! Submit your landing page today.